Dr. Neil Kobrin, a licensed clinical psychologist, LCSW and MFT with decades of experience in human transformation and emotional well-being, is delighted to join Mind Therapy Clinic. He is a pioneer of Mindful Psychology, a theory he developed that integrates aspects of mindfulness with Western and Eastern psychology; neuroscience, specifically affective neuroscience; health and wellness; and consciousness and spirituality. It is a holistic approach to mental well being that combines elements of each discipline and blends them into a theory of human functioning that is based on current research and science. After attending the University of California, Berkeley, Dr. Kobrin went on to complete his PhD in clinical psychology. He began his career as a psychotherapist and a professor of psychology and eventually became president/CEO of a professional psychology graduate school which he helped transform into a multi-campus national university. Dr. Kobrin plays an active role in the Academy of Mindful Psychology, an organization founded by him and designed to provide education and training in Mindful Psychology, a theory developed by him. Mindful Psychology is an interdisciplinary theory that integrates aspects of mindfulness with Western and Eastern psychology; neuroscience, specifically affective neuroscience; health and wellness; and consciousness and spirituality. It is a holistic approach that combines essential elements of these disciplines and blends them into a theory of human functioning that is based on current research and science alike. He has recently developed an online course entitled “Manifesting Emotional Well-Being” which is available to the general public. Dr Kobrin is also an Educational Consultant, working with a variety of higher education schools throughout the country and an Executive Consultant, assisting companies and corporations. Why he joined Mind Therapy Clinic. My PhD in Clinical Psychology emphasized family systems and providing family therapy. I was a founding member of the Family Therapy Institute and for more than a decade I focused on working with families that had significant challenges, particularly in the areas of addiction, abuse and dual diagnosis. By joining the staff of the Mind Therapy Clinic I feel as though I am returning to my roots as a clinician. Emotional Well-Being: Embracing the Gift of Life shows us how through mindful awareness and embracing the present moment, we can transform our life. It provides a rich illustration of how we developed emotionally and what we can do as adults to lead a happier, more meaningful life. What others say about Dr. Kobrin. Dr. 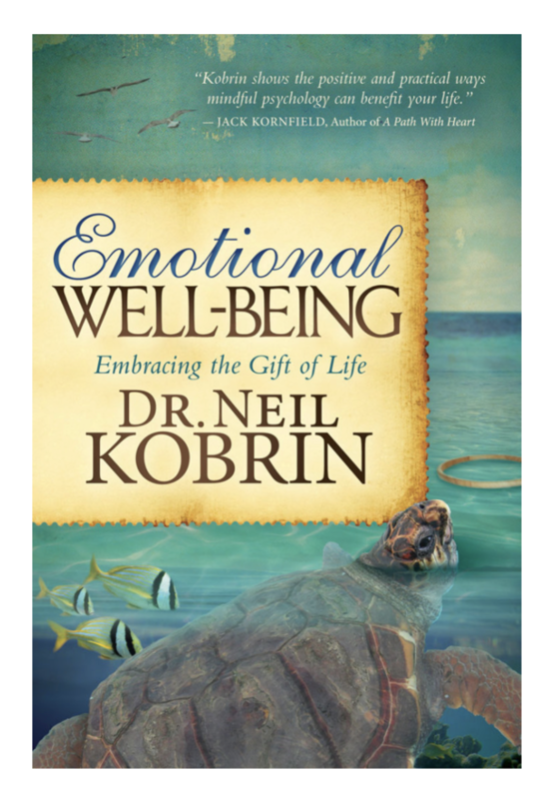 Neil Kobrin has taken a deep, piercing look at what it takes to dissolve our roadblocks to happiness. There is insight on every page. — Marianne Williamson, bestselling author of A Return to Love and internationally acclaimed spirituality lecturer. — Harville Hendrix, Ph. D., bestselling author of Getting the Love You Want: A Guide for Couples, and internationally acclaimed for his work with couples. — Jack Kornfield, Ph.D., bestselling author of A Path With Heart, co-founder of Insight Meditation Society and Spirit Rock Meditation Center.